Anjuman Matriculation H.S.S. 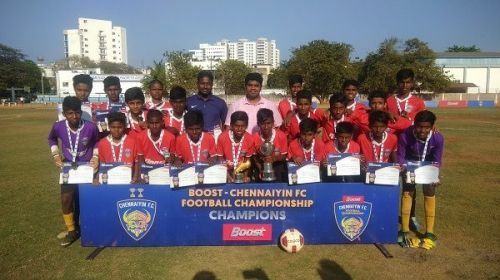 romped to the U-13 BOOST-Chennaiyin FC Football Championship title with a 9-0 win over St. Patrick's High School. Hat-tricks from Al Qamar and Umar Farooq along with goals from Md. Rasheed, Hayath Basha and Toufeeq Ahmed saw Anjuman outclass St. Patrick's in what was a one-sided final. In the U-15 category, Jeppiaar Matriculation H.S.S. blanked Vidya Mandir 8-0 in what was another one-sided encounter. The U-15 final too witnessed two hat-tricks, from Sriram and Jebarson, while Gabriel pitched in with a double. CFC first team Head Coach John Gregory and fan-favourite Dhanpal Ganesh were present for the presentation ceremony. They interacted with the kids, who received some valuable words of advice and appreciation. The winners from both age categories will receive a coaching session from CFC coaching staff and/or players as part of BOOST's #PlayThePros initiative. CFC scouts and youth team coaches attended every single game of the tournament, shortlisting talented boys who will receive an opportunity to be brought into the CFC age-group teams. Md. Rasheed picked up the Golden Boot award in the U-13 category with 9 goals while St. Patrick's goalkeeper Mathew Pratish won the Golden Glove award for securing five clean sheets. Sudharsan from St. Patrick's won the Golden Ball award as the best player of the tournament. In the U-15 category, the Golden Ball was awarded to SBOA's Arvind Karthik. 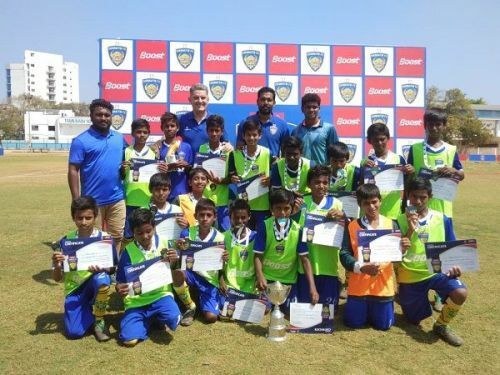 Title-winning Jeppiaar's Jebarson took home the Golden Boot with 8 goals while the Golden Glove went to Vidya Mandir's Adithya Balaji with five clean sheets.